↑ 3.0 3.1 3.2 Reilly, Michael (11 March 2011). "Japan's quake updated to magnitude 9.0". New Scientist (Short Sharp Science ed.). สืบค้นเมื่อ 11 March 2011. ↑ 7.0 7.1 "New USGS number puts Japan quake at 4th largest". CBS News. 14 มีนาคม 2554. สืบค้นเมื่อ 15 มีนาคม 2554. 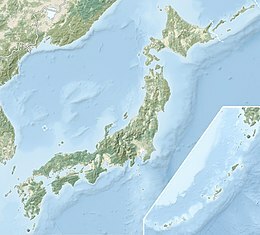 ↑ "Tsunami hits north-eastern Japan after massive quake". BBC News. UK. 11 March 2011. สืบค้นเมื่อ 11 March 2011. ↑ Branigan, Tania (2011-03-13). "Tsunami, earthquake, nuclear crisis – now Japan faces power cuts". The Guardian. Archived from the original on 2011-03-15. สืบค้นเมื่อ 2011-03-15. ↑ 14.0 14.1 Roland Buerk. "Japan earthquake: Tsunami hits north-east". News. UK: BBC. สืบค้นเมื่อ 12 March 2011. ↑ 15.0 15.1 15.2 "Tsunami bulletin number 3". Pacific Tsunami Warning Center/NOAA/NWS. 11 March 2011. สืบค้นเมื่อ 11 March 2011. ↑ 16.0 16.1 Wire Staff (11 March 2011). "Tsunami warnings issued for at least 20 countries after quake". CNN. สืบค้นเมื่อ 11 March 2011. ↑ 17.0 17.1 "PTWC warnings complete list". สืบค้นเมื่อ 11 March 2011. ↑ "3 nuclear reactors melted down after quake, Japan confirms". CNN. สืบค้นเมื่อ 2011-06-06. ↑ 20.0 20.1 20.2 "Quake shifted Japan by over two meters". Deutsche Welle. March 14, 2011. สืบค้นเมื่อ March 14, 2011. ↑ Kenneth Chang (March 13, 2011). "Quake Moves Japan Closer to U.S. and Alters Earth's Spin". The New York Times. สืบค้นเมื่อ 2011-03-14. ↑ By the CNN Wire Staff. "Report: Explosion at Japanese nuclear plant". Edition.cnn.com. สืบค้นเมื่อ 2011-03-12. ↑ "Huge blast at Japan nuclear power plant (with video of explosion)". BBC News. 12 March 2011. สืบค้นเมื่อ 12 March 2011. ↑ Molly Hennessy-Fiske (13 March 2011). "Japan earthquake: Insurance cost for quake alone pegged at $35 billion, AIR says". Los Angeles Times. สืบค้นเมื่อ 13 March 2011. ↑ Victoria Kim (March 21, 2011). "Japan damage could reach $235 billion, World Bank estimates". Los Angeles Times. สืบค้นเมื่อ March 21, 2011. ↑ Lovett, Richard A. (2011-03-14). "Japan Earthquake Not the "Big One"?". National Geographic News. Archived from the original on 2011-03-15. สืบค้นเมื่อ 2011-03-15. ↑ "地震情報 – 2011年3月10日 15時6分 – 日本気象協会 tenki.jp". Archived from the original on 18 April 2011. 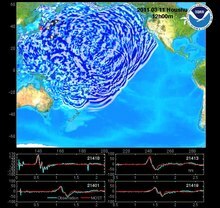 "地震情報 – 2011年3月11日 15時15分 – 日本気象協会 tenki.jp". Archived from the original on 18 April 2011. 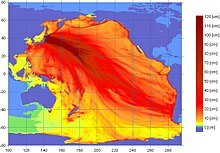 "地震情報 – 2011年3月11日 15時26分 – 日本気象協会 tenki.jp". Archived from the original on 18 April 2011. ↑ "Earthquake Information". Japan Meteorological Agency. Archived from the original on 12 March 2011. สืบค้นเมื่อ 11 March 2011. ↑ 34.0 34.1 Marcia McNutt (12 March 2011). Energy from quake: if harnessed, could power L.A. for a year. CBS News via YouTube (Google). Archived from the original on 18 April 2011. สืบค้นเมื่อ 13 March 2011. ↑ Foster, Peter. "Alert sounded a minute before the tremor struck". The Daily Telegraph. Archived from the original on 2011-03-11. สืบค้นเมื่อ 2011-03-11. ↑ Talbot, David. "80 Seconds of Warning for Tokyo". MIT Technology Review. สืบค้นเมื่อ 2011-03-11. ↑ "USGS Updates Magnitude of Japan's 2011 Tohoku Earthquake to 9.0". United States Geological Survey (USGS). 14 March 2011. Archived from the original on 14 March 2011. สืบค้นเมื่อ 18 March 2011. ↑ Ian Sample. "newspaper: Japan earthquake and tsunami: what happened and why". Guardian. สืบค้นเมื่อ 2011-03-14. ↑ 41.0 41.1 41.2 41.3 41.4 41.5 Chang, Kenneth (2011-03-13). "Quake Moves Japan Closer to U.S. and Alters Earth's Spin". The New York Times. สืบค้นเมื่อ 2011-03-14. ↑ Maugh, Thomas H (11 March 2011). "Size of Japan's quake surprises seismologists". Los Angeles Times. Archived from the original on 18 April 2011. สืบค้นเมื่อ 11 March 2011. ↑ "地震調査委 想定外の連動地震 NHKニュース". .nhk.or.jp. Archived from the original on 11 March 2011. สืบค้นเมื่อ 12 March 2011. ↑ "時事ドットコム：Ｍ８．８、死者３００人超＝行方不明５４０人以上−大津波１０ｍ・宮城で震度７". Jiji.com. Archived from the original on 18 April 2011. สืบค้นเมื่อ 12 March 2011. ↑ "気象庁"マグニチュードは９．０" NHKニュース". .nhk.or.jp. Archived from the original on 27 March 2011. สืบค้นเมื่อ 13 March 2011. ↑ "asahi.com（朝日新聞社）：地殻破壊３連鎖、計６分 専門家、余震拡大に警鐘 – 東日本大震災". Asahi Shimbun. Archived from the original on 18 April 2011. สืบค้นเมื่อ 13 March 2011. ↑ "asahi.com（朝日新聞社）：「数キロ内陸まで津波」 東大地震研・佐竹教授 – 東日本大震災". Asahi Shimbun. Archived from the original on 18 April 2011. สืบค้นเมื่อ 12 March 2011. ↑ Alabaster, Jay, "Quake shifted Japan; towns now flood at high tide", Yahoo! News, 9 May 2011. ↑ Lavelle, Michelle (2011-03-14). "Japan Battles to Avert Nuclear Power Plant Disaster". National Geographic News. สืบค้นเมื่อ 2011-03-16. ↑ "EQECAT Analyzes Specific Exposures from Japan Quake/Tsunami". Insurance Journal. Wells Publishing. 2011-03-15. สืบค้นเมื่อ 2011-03-16. ↑ Erol Kalkan, Volkan Sevilgen (17 March 2011). "March 11, 2011 M9.0 Tohoku, Japan Earthquake: Preliminary results". United States Geological Survey. Archived from the original on 31 March 2011. สืบค้นเมื่อ 22 March 2011. ↑ Rincon, Paul (14 March 2011). "How the quake has moved Japan". BBC News. Archived from the original on 14 March 2011. สืบค้นเมื่อ 15 March 2011. ↑ Reilly, Michael (12 March 2011). "Japan quake fault may have moved 40 metres". New Scientist. Archived from the original on 12 March 2011. สืบค้นเมื่อ 15 March 2011. ↑ Reilly, Michael (2011-03-12). "Japan quake fault may have moved 40 metres". New Scientist. สืบค้นเมื่อ 2011-03-15. ↑ 63.0 63.1 63.2 Chai, Carmen (2011-03-11). "Japan's quake shifts earth's axis by 25 centimetres". Montreal Gazette. Postmedia News. Archived from the original on 2011-03-13. สืบค้นเมื่อ 2011-03-13. ↑ 64.0 64.1 "Earth's day length shortened by Japan earthquake". CBS News. 2011-03-13. สืบค้นเมื่อ 2011-03-13. ↑ Harris, Bethan (2011-03-14). "Can an earthquake shift the Earth's axis?". BBC News. สืบค้นเมื่อ 2011-03-15. ↑ Hennessy-Fiske, Molly (2011-03-13). "Volcano in southern Japan erupts". Los Angeles Times. Archived from the original on 2011-03-13. สืบค้นเมื่อ 2011-03-13. ↑ Ananthaswamy, Anil (2011-03-15). "Japan quake shifts Antarctic glacier". สืบค้นเมื่อ 2011-03-15. ↑ CNN Wire Staff (11 April 2011). "At least 6 killed in new Japan earthquake". articles.cnn.com. CNN World News. สืบค้นเมื่อ 2011-04-23. ↑ "Distance between Dichato, Chile and Sendai, Japan is 17228km". Mapcrow.info. 2007-10-23. สืบค้นเมื่อ 2011-03-15. ↑ "The circumference of the earth is about 40,000km". Geography.about.com. 2010-06-16. สืบค้นเมื่อ 2011-03-15. ↑ "Tsunami Information (Estimated Tsunami arrival time and Height)". 2011-03-11. ↑ 87.0 87.1 "News: Tsunami rolls through Pacific, Sendai Airport under water, Tokyo Narita closed, Pacific region airports endangered". Avherald.com. 2001-07-06. สืบค้นเมื่อ 2011-03-11. ↑ "10-meter tsunami observed in area near Sendai in Miyagi Pref". The Mainichi Daily News. 2011-03-11. สืบค้นเมื่อ 2011-03-11. ↑ "Japan 8.9-magnitude earthquake sparks massive tsunami". Herald Sun. Associated Press. สืบค้นเมื่อ 2011-03-11. ↑ "Earthquake, tsunami wreak havoc in Japan". rian.ru. 2011-03-11. สืบค้นเมื่อ 2011-03-13. ↑ "9,500 unaccounted for in Miyagi's Minamisanriku: local gov't – The Mainichi Daily News". Mdn.mainichi.jp. สืบค้นเมื่อ 2011-03-13. ↑ Kyodo News, "2,000 more added to death toll in Miyagi[ลิงก์เสีย]", Japan Times, 15 March 2011, p. 1. ↑ Tritten, Travis, J., and T. D. Flack, "U.S. rescue teams find devastation in northern city of Ofunato", Stars and Stripes, 15 March 2011, Retrieved 16 March 2011. ↑ Kyodo News, "Miyagi coastal whaling port pulverized, little more than memory[ลิงก์เสีย]", Japan Times, 18 March 2011, p. 3. ↑ Kyodo News, "Death toll may surpass 10,000 in Miyagi[ลิงก์เสีย]", Japan Times, 14 March 2011, p. 1. ↑ Alabaster, Jay, and Todd Pitman, (Associated Press), "Hardships, suffering in earthquake zone[ลิงก์เสีย]", Japan Times, 15 March 2011, p. 3. ↑ Kyodo News, "Survivors on cut-off isle were ready for disaster[ลิงก์เสีย]", Japan Times, 19 March 2011, p. 2. ↑ "Researchers: 30-meter tsunami in Ofunato". NHK. Archived from the original on 4 April 2011. สืบค้นเมื่อ 29 March 2011. ↑ "38-meter-high tsunami triggered by March 11 quake: survey". Kyodo News. 2011-04-03. Archived from the original on 2011-04-06. ↑ "Tsunami Warning and Advisory #7 issued 03/11/2011 at 3:39 am PST". Archived from the original on 18 April 2011. สืบค้นเมื่อ 11 March 2011. ↑ 123.0 123.1 "B.C. tsunami threat passes". CBC.ca. 11 March 2011. Archived from the original on 18 April 2011. สืบค้นเมื่อ 13 March 2011. ↑ "Tsunami washes away feathered victims west of Hawaii". CNN. 19 March 2011. Archived from the original on 18 April 2011. สืบค้นเมื่อ 19 March 2011. ↑ "South Pacific islands hit by tsunami swells". 11 March 2011. Archived from the original on 18 April 2011. สืบค้นเมื่อ 13 March 2011. ↑ (สเปน) Más de 200 casas dañadas dejó seguidilla de olas[ลิงก์เสีย]. ANSA Latina. 03/13/2011. ↑ (สเปน) Caldera: 80 viviendas resultaron destruidas en Puerto Viejo por efecto de las olas. Radio Bio-Bio. 3/12/2011. ↑ (สเปน) Más de 200 casas dañadas dejó seguidilla de olas que azotaron las costas chilenas La Tercera. 3/12/2011. ↑ "Gareth Morgan's Galapagos hotel destroyed by tsunami". The National Business Review. 2011-03-13. สืบค้นเมื่อ 2011-03-17. ↑ "Ecuador Sends Aid To Galapagos After Islands Hit By Tsunami From Japan". LATIN AMERICA NEWS DISPATCH. 2011-03-15. สืบค้นเมื่อ 2011-03-17. ↑ "Japan tsunami caused icebergs to break off in Antarctica". European Space Agency. 9 August 2011. ↑ "film shown by BBC showing only rubble where there were buildings". Bbc.co.uk. สืบค้นเมื่อ 2011-03-14. ↑ "Before-and-after satellite photographs of devastated regions". Picasaweb.google.com. สืบค้นเมื่อ 2011-03-14. ↑ "animated images showing undamaged places become damaged". BBC. สืบค้นเมื่อ 2011-03-15. ↑ Onishi, Norimitsu (2011-03-13). "Seawalls Offered Little Protection Against Tsunami's Crushing Waves". The New York Times. สืบค้นเมื่อ 2011-03-15. ↑ NHK, "190,000 buildings damaged by March 11 quake", 3 April 2011. ↑ Kyodo News, "Fishermen to Tepco: Don't release water[ลิงก์เสีย]", Japan Times, 9 June 2011, p. 1. ↑ Kamiya, Setsuko, "Debris removal, recycling daunting, piecemeal labor[ลิงก์เสีย]", Japan Times, 30 June 2011, p. 3. ↑ Kyodo News, "Applications to deregister cars lost in tsunami soar[ลิงก์เสีย], Japan Times, 16 June 2011, p. 1. ↑ Kyodo News, "90% of disaster casualties drowned[ลิงก์เสีย]", Japan Times, 21 April 2011, p. 2. ↑ Kyodo News, "378 students killed, 158 missing in disaster[ลิงก์เสีย]", Japan Times, 29 April 2011, p. 2. The victims included 234 elementary, 111 junior high and 191 high school students. Direct quote: "Out of the 378 students confirmed dead, 273 were in Miyagi, 59 in Fukushima and 46 in Iwate. The list of missing students is made up of 74 in Miyagi, 52 in Iwate and 32 in Fukushima." ↑ "Japan confirms death of 19 foreigners in March 11 quake, tsunami". Kyodo News. 5 April 2011. Archived from the original on 7 April 2011. สืบค้นเมื่อ 7 April 2011. ↑ "Japan Tsunami Strikes Indonesia, One Confirmed Dead". The Jakarta Globe. 12 March 2011. Archived from the original on 12 March 2011. สืบค้นเมื่อ 12 March 2011. ↑ "California tsunami death: NorCal man drowns trying to photograph tsunami – KSWB". Fox5sandiego.com. Archived from the original on 18 April 2011. สืบค้นเมื่อ 14 March 2011. ↑ Associated Press (13 March 2011). "Man swept out to sea by tsunami was Bend native". The Oregonian. Archived from the original on 15 March 2011. สืบค้นเมื่อ 27 March 2011. ↑ "Klamath tsunami victim identified; search comes up empty". The Times-Standard. Eureka, CA. 13 March 2011. Archived from the original on 18 April 2011. สืบค้นเมื่อ 27 March 2011. ↑ Tsunami victim remains wash ashore near Fort Stevens[ลิงก์เสีย]. Koinlocal6.com (2011-03-12). Retrieved on 2011-05-02. ↑ 165.0 165.1 "Japan initiates emergency protocol after earthquake". Nuclear Engineering International. 11 March 2011. Archived from the original on 18 April 2011. สืบค้นเมื่อ 11 March 2011. ↑ "Japan's nuclear fears intensify at two Fukushima power stations". The Guardian. 2011-03-13. สืบค้นเมื่อ 2011-03-13. ↑ "Helicopters dump water on nuclear plant in Japan". CNN. สืบค้นเมื่อ 2011-03-17. ↑ "東京消防庁 ３号機に向け放水". NHK News. 2011-03-19. Archived from the original on 2011-03-21. สืบค้นเมื่อ 2011-03-19. ↑ 171.0 171.1 McCurry, Justin (11 March 2011). "Japan Declares 'Nuclear Emergency' after Quake". The Guardian. London. Archived from the original on 12 March 2011. สืบค้นเมื่อ 11 March 2011. ↑ "Japan Tsunami". BBC News. Archived from the original on 28 January 2011. สืบค้นเมื่อ 11 March 2011. ↑ "Radioactive Material May Have Leaked from Japanese Reactor". CNN International. 11 March 2011. Archived from the original on 18 April 2011. สืบค้นเมื่อ 11 March 2011. ↑ "asahi.com（朝日新聞社）：福島市内の水道水から放射性物質検出 国の基準は下回る – 東日本大震災". Asahi Shimbun. 3 January 2011. Archived from the original on 18 April 2011. สืบค้นเมื่อ 17 March 2011. ↑ "１都５県の水道水から放射性物質、国基準下回る : 科学". Yomiuri Shimbun. 19 March 2011. Archived from the original on 18 April 2011. สืบค้นเมื่อ 19 March 2011. ↑ "水道水 制限値を全国で下回る". NHK News. Archived from the original on 19 March 2011. สืบค้นเมื่อ 19 March 2011. ↑ "asahi.com（朝日新聞社）：原発から４０キロの土壌、高濃度セシウム 半減期３０年 – 東日本大震災". Asahi.com. 1 March 2011. Archived from the original on 18 April 2011. สืบค้นเมื่อ 26 March 2011. ↑ Jae Hur. "Food Contamination Set to Rise as Japan Fights Radiation Crisis at Reactor". Bloomberg. Archived from the original on 18 April 2011. ↑ "High level of cesium detected in sand lances". NHK World. 5 April 2011. Archived from the original on 18 April 2011. ↑ Mogi, Chikako (11 March 2011). "Fire at Tohoku Elec Onagawa nuclear plant -Kyodo | Reuters". Reuters. Archived from the original on 18 April 2011. สืบค้นเมื่อ 13 March 2011. ↑ "Fire at nuclear power plant extinguished". The Australian. 12 March 2011. Archived from the original on 18 April 2011. สืบค้นเมื่อ 13 March 2011. ↑ 187.0 187.1 "Sea water injected into troubled Fukushima power plant | The Manila Bulletin Newspaper Online". mb.com.ph. 2011. Archived from the original on 18 April 2011. สืบค้นเมื่อ 13 March 2011. ↑ "IAEA update on Japan Earthquake". iaea.org. 2011. Archived from the original on 12 March 2011. สืบค้นเมื่อ 13 March 2011. ↑ "IAEA update on Japan Earthquake". iaea.org. 13 March 2011. Archived from the original on 12 April 2011. สืบค้นเมื่อ 13 March 2011. ↑ "Cooling system pump stops at Tokai No.2 plant-Kyodo; Energy & Oil; Reuters". af.reuters.com. 13 March 2011. Archived from the original on 18 April 2011. สืบค้นเมื่อ 13 March 2011. ↑ Takenaka, Kiyoshi (13 March 2011). "Tokai No.2 nuke plant cooling process working – operator | Reuters". uk.reuters.com. Archived from the original on 18 April 2011. สืบค้นเมื่อ 13 March 2011. ↑ 195.0 195.1 Nihon Keizai Shimbun, "90 percent of major transport networks back in operation", 29 March 2011. ↑ "Tokyo Disneyland hit by liquefaction after quake". MediaCorp Channel NewsAsia. 2011-03-11. สืบค้นเมื่อ 2011-03-11. ↑ 197.0 197.1 197.2 "Japan issues top tsunami warning after major quake". MediaCorp Channel NewsAsia. 2011-03-11. สืบค้นเมื่อ 2011-03-11. ↑ "Japan's Afternoon of Horror". The Gulf Today. 2011-03-12. Archived from the original on 2011-03-13. สืบค้นเมื่อ 2011-03-13. ↑ "1,500 dead or missing after huge earthquake, tsunami". Asahi Shimbun. 2011-03-13. Archived from the original on 2011-03-13. สืบค้นเมื่อ 2011-03-13. 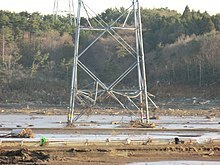 ↑ "Dam Breaks In Northeast Japan, Washes Away Homes". Arab Times. 2011-03-12. สืบค้นเมื่อ 2011-03-14. ↑ "A quick report on Japanese Dams after the Earthquake". Chinese National Committee on Large Dams. 2011-03-12. สืบค้นเมื่อ 2011-03-15. ↑ 207.0 207.1 Nomiyama, Chiz (21 March 2011). "Factbox: Japan disaster in figures". Reuters. Archived from the original on 21 March 2011. สืบค้นเมื่อ 21 March 2011. ↑ "People near Japan nuke plant told to leave". News. AU: Yahoo!. Archived from the original on 2011-09-01. ↑ Joe, Melinda, "Kanto area works on energy conservation[ลิงก์เสีย]", Japan Times, 17 March 2011, p. 11. ↑ Hongo, Jun, "One certainty in the crisis: Power will be at a premium[ลิงก์เสีย]", Japan Times, 16 March 2011, p. 2. ↑ Nakata, Hiroko, "Auto industry agrees to adopt weekend work shifts[ลิงก์เสีย]", Japan Times, 20 May 2011, p. 1. ↑ Wood, Elisa (2011-05-25). "The Dangers of Energy Generation". Renewable Energy World. Archived from the original on 2011-06-03. ↑ 219.0 219.1 219.2 Fernandez, Clarence (2011-03-14). "Japan's shipping, energy sectors begin march back from quake". Reuters. Archived from the original on 2011-03-14. สืบค้นเมื่อ 2011-03-14. ↑ Fires, safety checks take out Japanese refineries Argus Media, 14 March 2011. Accessed: 18 March 2011. ↑ Japanese refiners try to offset shortages Argus Media, 15 March 2011. Accessed: 18 March 2011. ↑ Analysis - Oil markets adjust to Japan’s disaster Argus Media, 16 March 2011. Accessed: 18 March 2011. ↑ Japan quake begins to impact LNG trade Argus Media, 15 March 2011. Accessed: 18 March 2011. ↑ Tsunami Disaster: “Japan’s Sendai says LNG Infrastructure Badly Damaged” Argus Media, 16 March 2011. Accessed: 18 March 2011. ↑ "Fears of massive death toll as ten-metre tall tsunami races across Pacific after sixth largest earthquake in history hits Japan". Daily Mail. 2011-03-11. สืบค้นเมื่อ 2011-03-11. ↑ NHK World, "Tohoku Expressway Reopened To All Traffic", 24 March 2011. ↑ "Many Rail Services In Tokyo Suspended After Quake". NIKKEI. 2011-03-12. สืบค้นเมื่อ 2011-03-12. ↑ "Full Tohoku Shinkansen Line services to be restored by late April". The Asahi Shimbun Company. 30 March 2001. Archived from the original on 18 April 2011. สืบค้นเมื่อ 2 April 2011. ↑ "asahi.com（朝日新聞社）：東北新幹線、東京―那須塩原で再開　各停、１時間に１本". Asahi Shimbun. 15 March 2001. Archived from the original on 18 April 2011. สืบค้นเมื่อ 15 March 2011. ↑ "No. of dead or missing tops 22,000; bodies buried in rare measure". JAPANTODAY. 22 March 2001. Archived from the original on 18 April 2011. สืบค้นเมื่อ 2 April 2011. ↑ "Gradual Restoration Of Infrastructure Continues At Disaster Areas". Nikkei. 18 March 2001. Archived from the original on 18 April 2011. สืบค้นเมื่อ 2 April 2011. ↑ "asahi.com（朝日新聞社）：計画停電で影響が出る主な鉄道（午前７時現在） – 社会". Asahi Shimbun. Archived from the original on 18 April 2011. สืบค้นเมื่อ 14 March 2011. ↑ "Tokyo phone lines jammed, trains stop". Times of India. 2011-03-12. The temblor shook buildings in the capital, left millions of homes across Japan without electricity, shut down the mobile phone network and severely disrupted landline phone service. ↑ "In Japan, Many Undersea Cables Are Damaged: Broadband News and Analysis «". Gigaom.com. สืบค้นเมื่อ 2011-03-17. ↑ Cowie, James (2011-03-11). "Japan Quake – Renesys Blog". Renesys.com. สืบค้นเมื่อ 2011-03-15. ↑ 246.0 246.1 "Japan's phone networks remain severely disrupted". Computerworld. 2011-03-12. ↑ "AT&T, Sprint & Verizon Offer Free Calls & Texts to Japan from U.S. [UPDATED]". Archived from the original on 18 April 2011. สืบค้นเมื่อ 30 March 2011. ↑ "netTALK Extends Free Calling to Japan Through April". Archived from the original on 18 April 2011. สืบค้นเมื่อ 30 March 2011. ↑ "Vonage offers free calls to Japan". Archived from the original on 18 April 2011. สืบค้นเมื่อ 30 March 2011. ↑ Malik, Tariq (2011-03-12). "Quake forces closure of Japanese space center". msnbc.com. สืบค้นเมื่อ 2011-03-17. ↑ "spaceflightnow.com". Stephen Clark. Archived from the original on 18 April 2011. สืบค้นเมื่อ 28 March 2011. ↑ "国宝の松島・瑞巌寺、壁４、５カ所にひび割れ　文化庁". Asahi Shimbun. 14 March 2011. Archived from the original on 17 March 2011. สืบค้นเมื่อ 25 March 2011. ↑ "asahi.com（朝日新聞社）：避難者、１６都県で３１万９１２１人―２１日午後１１時 – 社会". Asahi.com. 2011-03-21. Archived from the original on 2011-03-22. สืบค้นเมื่อ 2011-03-29. ↑ "Japan looks for market stability after quake". The Independent. 2011-03-13. สืบค้นเมื่อ 2011-03-13. หน้านี้แก้ไขล่าสุดเมื่อวันที่ 11 มีนาคม 2562 เวลา 06:29 น.